Robert Johnston Carson is on the right. On the left is his wife and in the middle are their three children. “Honk!” The foghorns call fades as it slips through the ears, and feet clamber unsteadily up the swaying dock towards the ship waiting beyond. The weak wood, barely held together through the metal spikes impaling them, cries out as it’s stressed. The salty breeze stings the eyes and rips through the sails, whipping the air. The breath hitches in the throat as air is being choked down and released, and the last steps up the gangplank are taken, landing on the deck as “All aboard!” rings through the surrounding air. The senses come rushing back in as the weight of goodbye rests on heavy shoulders; the ship breaks free from the pull of home and heads into the horizon of a new life. My great great grandfather, my grandmother’s grandfather, Robert Johnston Carson, was aboard this ship leaving Ireland forever, heading to the new world, the United States of America. Robert Johnston Carson, born on December 4th, 1891 in Omagh, Ireland, was 19 when he parted ways with his home in Ireland. His parents, his twin brother Thomas and his sister Anne were all left behind as he went alone to seek out the American Dream. To him the American Dream was to own his own house and life, and he thought the United States had more opportunity to make money then he would’ve had back in Ireland. Robert also wanted to be independent of his father, who was a very strong individual, and make his own mark on the world without anyone else doing so for him. He wanted to leave the scrutiny of his father and have a chance of owning his own house and grocery store, so he left behind all he held dear. Robert’s childhood in Ireland, before he departed, has sadly been lost through the generations, and none of his relatives are able to recount his early life. However, it is known that he never had much education and only went through high school, never through college, so when he came to the states, he had some education and was able to read and write (through the generations to follow, my grandmother was the first on her side of the family to attend college). It is uncertain, however, if Robert spoke Gaelic. He knew English, so there was nothing preventing him from intermingling with Americans but he could also have spoken Gaelic as well. On October 4th, 1910, Robert boarded the Columbia ship from Londonderry port to Ellis Island in the States. He carried nothing to his new life except the clothes he wore and $25 in his pocket. He truly left his entire life of familiarity behind for a chance to be free of his father’s grasp. Once he landed in Ellis Island–October 11th, 1910–after seven days at sea on the ever swaying ship, he started the rigorous process of gaining citizenship. His cousin, who lived in Brooklyn, New York at the time, sponsored his entry into the states, as all immigrants were required to have. He lived with his cousin for a few years after arriving. Robert moved to Pennsylvania for better job opportunities a few years after he arrived. He most likely rode the train and walked part of the way to get there from New York. There he met his wife, Estella Hopkins, whose family came from England. They settled in Philadelphia, PA in 1914 where he had gotten a job as a grocer. Once he settled down, he applied for U.S. citizenship. In order to do so he had to live in the states for at least 5 years and was required to renounce his citizenship in Ireland. He couldn’t have dual citizenship, so this cut his ties to Ireland. 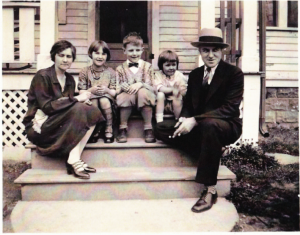 In 1917, Robert was promoted so he and Estella moved to Louisville, Kentucky for his new job as a supervisor. Two years later in 1919 he petitioned for naturalization. Also, during those following years, he and Estella had three kids while living in Kentucky. When Robert was promoted again, they moved to Royal Oaks, Michigan where he became a higher executive of A&P foods company. There, he and his family remained until he passed away due to ALS (Lou Gehrig’s disease–weakening of muscles). He was 70 when he died in 1962. Through his time in America, he built his entire life from scratch. He had to earn money in order to feed himself and his family he created. He worked for everything he had in his life here because he brought nothing over. Immigrants already had some restricted rights and opportunities so he had to fight and struggle for a life here; he was able to create and became something not only he himself, but the generations to follow him, could also be very proud of. My great great grandfather never regretted his leaving Ireland for a life here in the states, and no one in his family ever wished he hadn’t left or thought he made a poor decision. Sadly, a few years after he departed, his sister died in 1913 at age 26. Right after, his twin brother, Thomas, parted ways from Ireland as well to be separated from his father’s scrutiny just like his brother did. He moved to Canada and joined the military. Thomas was killed in combat during WW1 in 1916. He was only 25 years old. My great great grandfather never returned to Ireland after he left, so his goodbyes to his siblings truly were the last fleeting moments he was ever able to see them, and it was a heartbreaking separation and tearing of the bonds he had with them, especially his twin. He never saw the family he left behind ever again after that day on the docks in Ireland, but stayed in contact via mail so he would have received letters sent from his parents detailing the tragic deaths of his siblings. My great great grandfather was proud to be an American and to have bought his own home and paid for it in full. He was a hard working man who worked his way up the ranks of the grocery store business to become Vice President of the entire chain. He never owned his own grocery store but he was able to successfully own his own house and was the head of a family consisting of a wife and three children. My grandmother is very proud of her grandfather’s immigration story and his accomplishments here in the states, especially building a life from nothing. She holds his story very close and is inspired by him for all that he went through to get to where he was. She values her ancestry and can’t imagine what it was like for him to leave his home at age 19 alone, never to return or see anyone from it again. Five generations have lived here in the states since; my generation being the most recent. He left behind not only generations of family, but also the pride of being American and his accomplishments in attaining his life as an immigrant, from nothing but dedication, a dream and hard work. 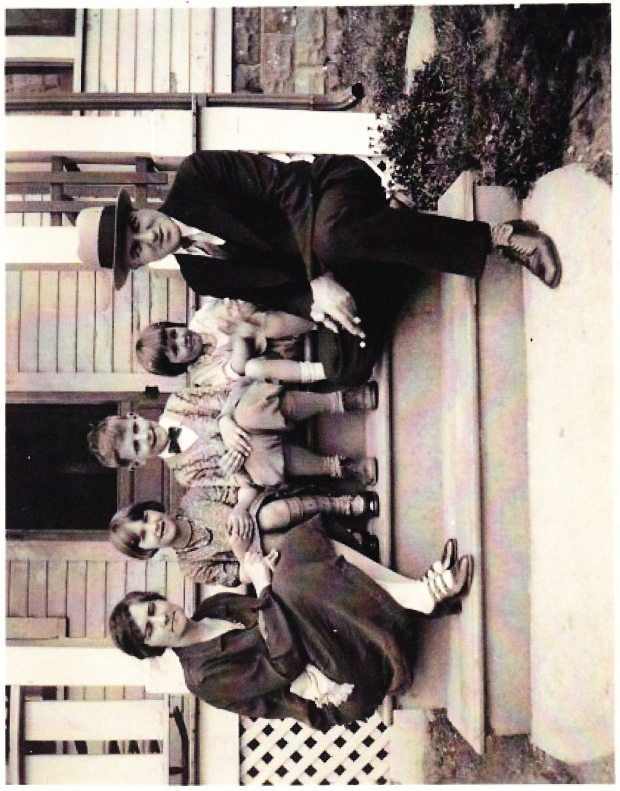 The story of Robert Johnston Carson was written and recorded by his great great grandchild, Lavender.